Observations with the Very Large Telescope Interferometer (VLTI) at the ESO Paranal Observatory (Chile) have provided the first-ever direct determination of the angular sizes of the disks of the solar-type stars Alpha Centauri A and Alpha Centauri B. As the two largest members of this triple stellar system that also includes the much smaller Proxima Centauri, they are the Sun's nearest neighbours in space at a distance of just over 4 light-years. 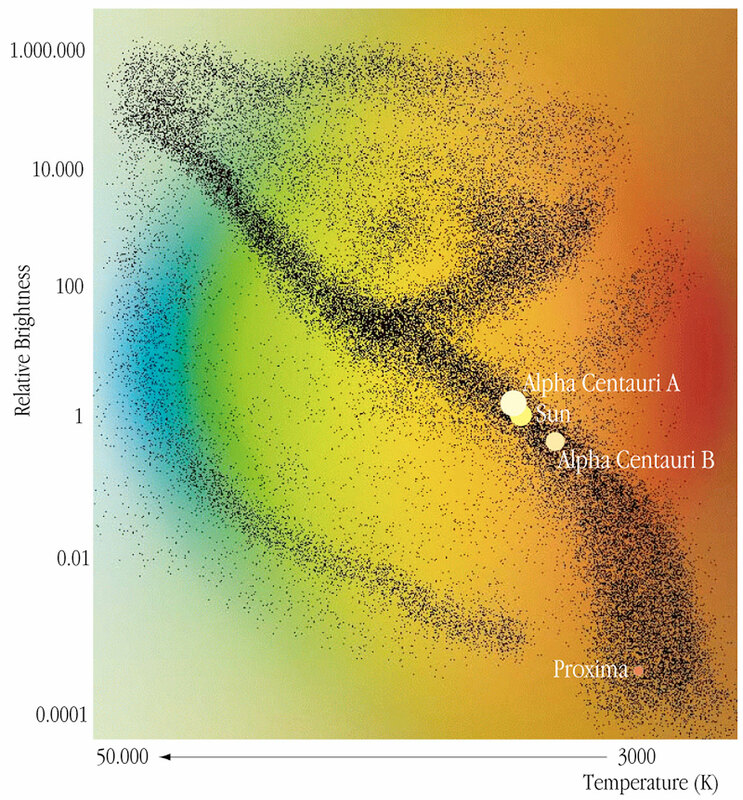 Together with photometric and asteroseismic observations, this fundamental measurement with the VLTI has lead to a complete characterization of Alpha Centauri A and Alpha Centauri B - they are now the "best known" stars. This has also allowed a unique and very detailed comparison between "real nature" and current stellar theory for solar-type stars. There is clearly very good agreement, indicating that the structure and evolution of stars like our Sun are well understood. The new observations of the nearest stars have therefore contributed to raise the astronomers' confidence in their solar models as well. We can now be more sure about the conditions inside the Sun, our central energy source, and also about the way it will change during the next hundreds of millions of years. The Alpha Centauri triple stellar system is our closest neighbour in space. It is located at a distance of 4.36 light-years, or 41 million million km, in the direction of the southern constellation Centaurus (The Centaur) . The two main stars in the system, Alpha Centauri A and Alpha Centauri B, are rather similar to the Sun; their stellar spectral types are "G2V" and "K1V", respectively. The third star is a "red dwarf" known as Proxima. It is much cooler and smaller than the other two. It was observed in 2002 with the VLT Interferometer. Alpha Centauri A and B orbit each other at a distance of about 3600 million km, or somewhat more than the distance of planet Uranus from the Sun . The orbital period is almost exactly 80 years. Their smaller companion, Proxima, is about 1.5 million million km (10,000 Astronomical Units) nearer to the solar system than A and B. It is possibly orbiting that pair with a period of millions of years. The A and B pair offers a unique possibility to study stellar physics in stars that are only slightly different from our own Sun. Their masses nicely bracket that of their neighbour star, and they are only slightly older than the Sun. 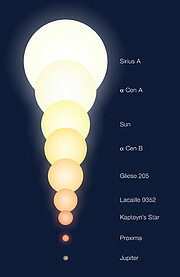 In addition to providing general information about stellar evolution, the detailed study of Alpha Centauri A and B is particular interesting as it allows verification of our current knowledge about the composition, structure and indeed, future development, of our own main energy source, the Sun. An international group of astronomers  has now used observations of Alpha Centauri A and Alpha Centauri B obtained with the ESO VLTI/Paranal team by the ESO Very Large Telescope Interferometer (VLTI) to measure the sizes of these two stars. Despite their proximity and brightness, these two southern stars have never before been resolved by long-baseline stellar interferometry, and the VINCI/VLTI observations are the first direct measurement of their angular diameters. For the observations of the A and B pair, the 0.35-m VLTI siderostats on the observing platform at the Paranal summit were used. These two small test telescopes were placed at distances of 16 and 66 metres, respectively (ESO Press Photo eso0307). They captured the light from the two stars and sent it on via a series of reflecting mirrors to the common focus in the commissioning instrument VINCI. Although they were obtained only a few days after the successful accomplishment of "First Fringes" with the VLTI, the 16-m measurements were found to be scientifically very useful and helped to improve the measurement of the angular diameter of Alpha Centauri A. 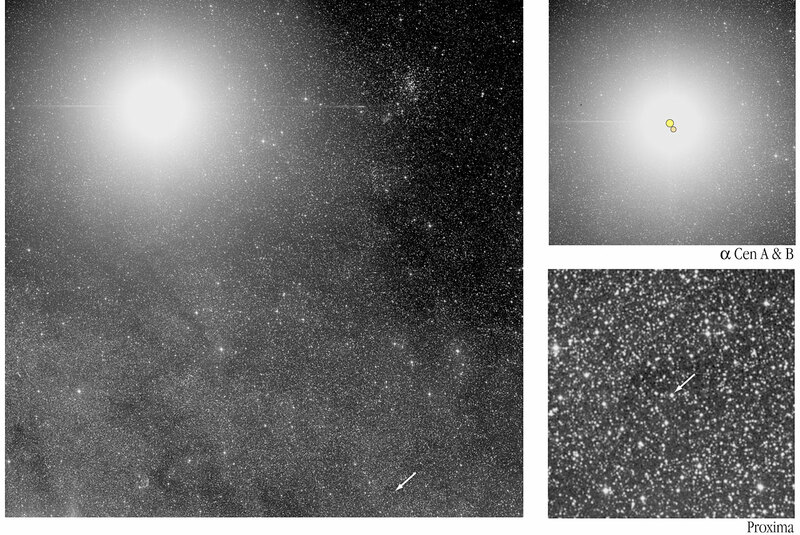 The 66-m baseline measurements provided the most accurate values of "calibrated visibilities" (ESO Press Photo eso0307) - from these, the angular diameters were then derived. The VLTI measurements provided high-quality angular diameter values for both stars, 8.512 ± 0.022 milliarcsec and 6.002 ± 0.048 milliarcsec for A and B, respectively. With the distance measured earlier by the Hipparcos satellite of the European Space Agency (ESA), 4.36 light-years or 41 million million km, the true radii were then found to be 854,000 km and 602,000 km, or 1.227 ± 0.005 and 0.865 ± 0.007 times the radius of the Sun, respectively. During the past years, a number of more distant binary stellar systems like Alpha Centauri A and B have been observed with different methods, including spectrophotometry (emission at different wavelengths) and astrometry (position in the sky; motions). When compared with theoretical models of the stars, such measurements determine the main stellar parameters, including the masses of each component, their ages, their luminosities, effective temperatures and content of various chemical elements. At the same time, these models predict the evolution of the stars with time , in particular how their luminosity and temperature gradually changes. In addition to these observational tools, and four decades after the discovery of the solar seismic frequencies in 1962, solar-like oscillations were recently detected in Alpha Centauri A, by means of observations with the CORALIE fiber-fed spectrograph installed at the ESO La Silla Observatory . Since then, "asteroseismic oscillations" have been detected in five more solar-like stars - they provide crucial information about the interiors of those stars and also about their masses and radii. 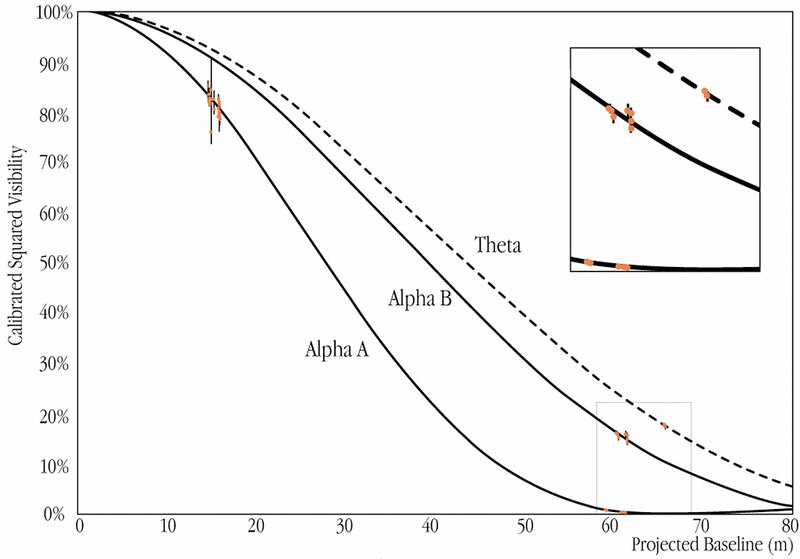 For instance, the comparison between the spacing of the observed frequencies in Alpha Centauri A in the high frequency range and those predicted by theory provides information about the size of the star. Some time ago, French astronomer Pierre Morel of the Observatoire de la Côte d'Azur (Nice, France) developed a very powerful computer code to simulate stellar interior physics. Recently, his group used this code to produce a new "model" of Alpha Centauri A, based on the best available photometric, astrometric, spectroscopic and asteroseismic observations . From this multi-technique calibration, the mass of Alpha Centauri B component was also deduced and, among other stellar parameters, the radii of both stars were predicted with high precision, as 1.230 ± 0.003 (star "A") and 0.857 ± 0.007 ("B") times that of the Sun, respectively. ESO astronomer Pierre Kervalla is happy: "The agreement between the VLTI measurements and the theory is very satisfactory for both stars. This confirms the validity of the multi-technique approach and with the interferometric measurement of Proxima obtained with the two 8.2-m VLT ANTU and MELIPAL telescopes, we now have a rather complete view of this famous triple system". His colleague Fréderic Thévenin at the Nice Observatory adds: "Alpha Centauri is not only the nearest stellar system - thanks to these studies, it is now also the best known one!". The indicated chemical composition is that at the surface of the star. The team will now extend these fundamental interferometric studies to other stars for which asteroseismic observations are available. For this, they will continue working at the VLT Interferometer, first with the VINCI test instrument, and later with the AMBER instrument that will combine the light beams from three telescopes at a time. 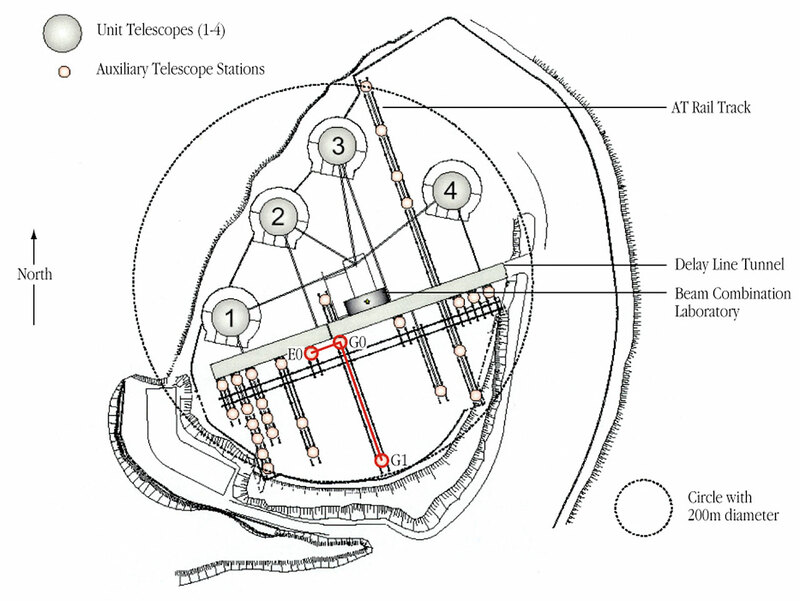 The first of the four 1.8-m Auxiliary Telescopes for the VLTI will arrive at Paranal in the course of 2003. There is little doubt that the unprecedented precision that is achievable with the VLTI, together with highly sensitive asterosismic measurements from the new HARPS spectrometer now being installed at the ESO 3.6-m telescope on La Silla and powerful computer software now available for stellar modelling will greatly improve our knowledge of these stars. This in turn will help us to better understand the structure and evolution of our own star, the Sun. : An instructive view of the spatial distribution of the stars nearest to the solar system is available. : Local astronomical distances are often indicated in Astronomical Units (AU), the mean distance between the Earth and the Sun (1 AU = 149,600,000 km). Another unit, the light-year - the distance that light, travelling at 300,000 km/sec, covers in one year - is useful for distances outside the solar system: 1 light-year = 9.5 million million km. : The team consists of Pierre Kervella (ESO Chile), Fréderic Thévenin, Gabriele Berthomieu, Bruno Lopez, Pierre Morel and Janine Provost (Observatoire de la Côte d'Azur, Nice France) and Damien Ségransan (Observatoire de Genève, Switzerland). : The diagram is named after Danish astronomer Einar Hertzsprung (1873-1967) and American astronomer Henry Norris Russell (1877 - 1957). At the beginning of the 20th century they independently noticed that red stars come in very different sizes, pioneering subsequent studies of stellar diameters. This diagram plots stellar temperature (or colour) against brightness (or magnitude) and is therefore also known as the "colour-magnitude diagram". : The discovery of solar seismic frequencies is described in a research article by Evans & Michard in the Astrophysical Journal (Vol. 136, page 493, 1962). Solar-like p-oscillations in Alpha Centauri A were announced by Bouchy & Carrier in Astronomy & Astrophysics (Vol. 374, page L5, 2001). : The calibration was done using the CESAM stellar model code (Morel, 1997, A&AS 124, 597), developed at the Nice Observatory. Among other parameters, the radii of the stars A and B were predicted with high precision (Thévenin et al., 2002, A&A, 392, L9). The information presented in this communication is based on a research article soon to appear in the European journal Astronomy & Astrophysics ("The diameters of Alpha Centauri A and B" by Pierre Kervella with the other members of the team as co-authors).